Kubernetes has some amazing primitives to help you deploy your applications, which let Kubernetes handle the heavy lifting of rolling out containerized applications. With Container Engine you can have your Kubernetes clusters up in minutes ready for your applications to land on them. But despite the ease of standing up this fine-tuned deployment engine, there are many things that need to happen before deployments can even start. And once they’ve kicked off, you’ll want to make sure that your deployments have completed safely and in a timely manner. To fill these gaps, developers often look to tools like Container Builder and Spinnaker to create continuous delivery pipelines. First, your developers tag your software and push it to a Git repository. When the tagged commit lands in your repository, Container Builder detects the change and begins the process of building and testing your application. Once your tests have passed, an immutable Docker image of your application is tagged and pushed to Container Registry. Spinnaker picks it up from here by detecting that a new Docker image has been pushed to your registry and starting the deployment process. Spinnaker’s pipeline stages allow you to create complex flows to roll out changes. The example here uses a canary deployment to roll out the software to a small percentage of users, and then runs a functional validation of your application. 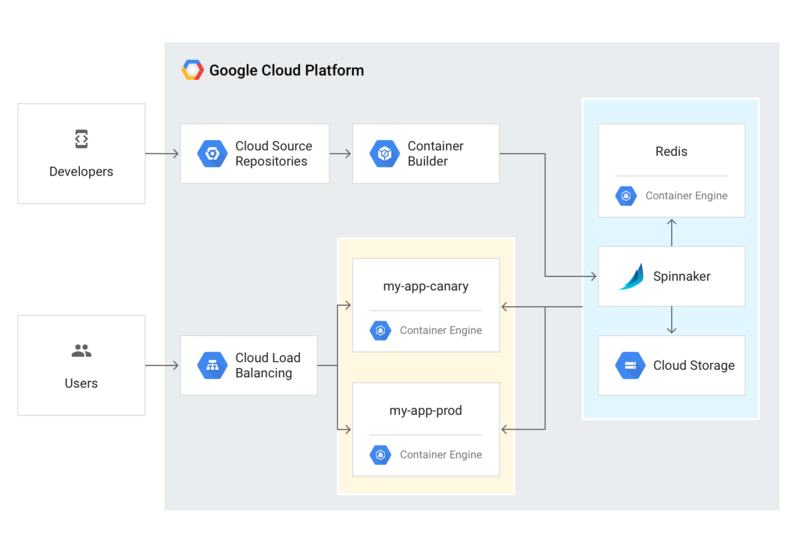 Once those functional checks are complete in the canary environment, Spinnaker pauses the deployment pipeline and waits for a manual approval before it rolls out the application to the rest of your users. Before approving it, you may want to inspect some key performance indicators, wait for traffic in your application to settle or manually validate the canary environment. Once you’re satisfied with the changes, you can approve the release and Spinnaker completes rolling out your software. As you can imagine, this exact flow won’t work for everyone. Thankfully Spinnaker and Container Builder give you flexible and granular stages that allow you to automate your release process while mapping it to the needs of your organization. Get started by checking out the Spinnaker solution. Or visit the documentation to learn more about Spinnaker’s pipeline stages.